On Sunday afternoon Goldie and I were taking our usual walk on the campus of Occidental College, enjoying the warm, sunny weather, when she stopped to poop. She assumed her normal crouch position then suddenly started screaming with an intensity I’d never heard from her before. At first, I thought one of her dew claws had caught on something, so I reached for her hind legs, but as soon as my hand got close, she took hold of my left thumb with her teeth, and bit hard. It hurt, but my pain was nothing compared to what she was feeling. Her screaming continued and I felt completely helpless. Droplets of blood appeared on the sidewalk and I worried she’d stepped on glass, but soon realized the blood was coming from my thumb. I grabbed a paper towel from my tote bag and squeezed it around my hand. Her screaming diminished, but I knew she was still in a lot of pain. Her back left leg was oddly twisted around her back right leg, like it had broken, but there had been no trauma. “Excuse me, ma’am, do you need help?” came a voice from behind. I turned around and saw a friendly, concerned college student. “She’ll bite you.” I showed him my bloody hand. “Can I use your towel?” He pointed to the towel I had in my tote bag, which I’d used for yoga in the grass just ten minutes earlier. I handed him the towel and he scooped Goldie up in his arms. “Where’s your car?” I told him it was a few blocks away and we slowly walked toward it. When we got there, he gently set Goldie on the floor in front of the passenger seat so she I could keep an eye on her. She yelped as he put her down. I drove as quickly as I could to the emergency vet, which was only half a mile away. I started to pick her up with the towel, but she let me know she wanted to hobble on her three available legs. As soon as we got in the door, I saw a familiar face, a docent I used to work with at the zoo. She gave me a big hug and looked at little Goldie. I explained what happened and she assured me the vets would figure it out and help her. She then shared that her seventeen-year-old cat was there getting treatment. Seeing a familiar face at a time of crisis was so comforting, especially this nice lady, whom I’d always liked. She’d known me the entire time my previous dog, Henry had worked with me at the zoo. I filled out a few forms and got checked in, then we waited. Goldie wouldn’t sit or lay down. She stood very still, guarding her twisted left leg. Her eyes were glassy, like she was in shock from the pain. A woman appeared behind the receptionist window and I recognized her as Dr. P., a vet I’d worked with a couple of years ago at the animal hospital where I volunteer. She saw me, smiled and waved. Once she finished what she was writing down she called out, “How are you?” The glass was thick, so I said I was okay and pointed down at Goldie. “Something happened to her leg.” I hoped she would get Goldie’s case, but even if she was too busy, it couldn’t hurt that I knew someone on staff. As freaked out as I was about Goldie’s distress, I was aware that the Universe/God was helping us, first with Theo, then with my docent friend and now Dr. P.
We waited an hour and a half before being seen, and we didn’t get Dr. P., but the nice young vet we did get Dr. G., was very sharp. He did x-rays and showed me that Goldie’s left hip was dislocated and needed to be put back in place. He also said Goldie would need a big surgery at some point. Dr. G. recommended that I take Goldie the following morning to my vet and have them reset the hip. He said he’d given her some pain medication to help her through the night. As we were waiting for Dr. G. to come back with discharge orders, I got a text from another vet, Dr. C., a friend from where I volunteer, telling me about a cute pair of shoes she’d found online that I might like. The timing of her text was perfect! I took the opportunity to ask her about Goldie’s diagnosis. She said she’d be happy to help the next day and that the other vet who would be there, Dr. H., could do the surgery if necessary. More angels in my life. The emergency vet sent us home with some pain medication and I carried Goldie to the car. She was still in a lot of pain and screeched at the slightest change in position, but she’d figured out a way to get somewhat comfortable. My job was to keep her still until I could get her to the vet first thing in the morning. She eagerly went into her crate, where I knew she’d be safe. The next morning, we showed up at 8 a.m. and Dr. H. was ready for us. The technicians prepped her for anesthesia and took more x-rays. Dr. H. showed me how far the leg had traveled from the hip. Poor little Goldie. 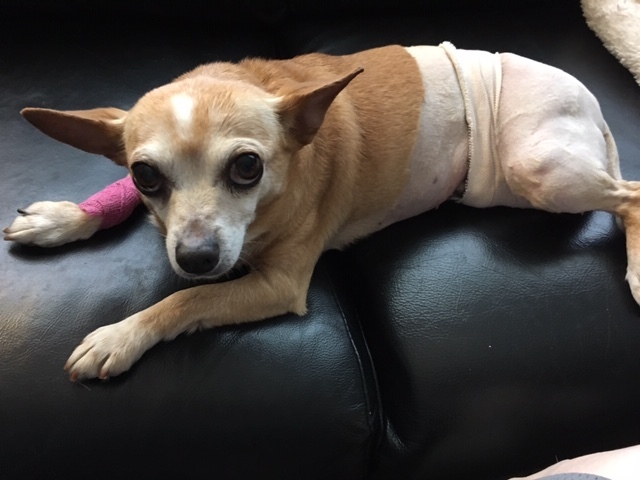 Once she was sedated, they shaved her body, just in case the doctor decided to do the surgery. He was going to see if he could reset the joint first. If it looked like it would stay in place, he’d wrap it and let it heal for two weeks. If it wasn’t a good fit, he’d do the surgery. I trusted his judgement. As long as he could stop Goldie’s suffering. Later in the afternoon I was able to take her home. She was still quite groggy from anesthesia and pain meds but wanted to go home. Dr. H. told me to bring her back every day for ten days to be checked. I thanked him and promised I would. I was able to carry her to the car without her screaming, which was an improvement. As soon as we got home, I put her in her crate, as instructed, so she wouldn’t dislocate her hip again. At around 7 p.m. I carried her to the back yard and set her down so she could pee. She was wobbly on three legs and wouldn’t pee but didn’t look to be suffering. As I looked at the sling/bandage, which held her food up tight against her body, I noticed that they’d bandaged the wrong leg! She’d dislocated the left one, but the bandage was on the right. I panicked when I saw that she had all her weight on her left leg. What if it came out of the socket again?? What should I do? I hoped that if I kept her very inactive until the next morning, I could get her back to the vet and have the correct leg wrapped. I texted Dr. C. for advice. She basically told me to keep her in the crate, as I’d planned. She was going to be okay. I’d go early in the morning and Dr. H. would fix his mistake. So, this morning Dr. H. sedated Goldie and put the sling/bandage on the correct leg. I’m hoping she’ll want to start eating and drinking again soon, but she’s a little confused from all the trauma and medications. I need to keep her in the crate at all times, except when we try to get her to pee. Carrying her around is a little hard, but I can do it. I’ll do whatever it takes to help my sweet baby heal. It’s possible that the hip will pop out again, in which case she’ll need the big surgery, but hopefully that day will never come. I’m trying to remember that this too shall pass, right? It’s been pretty stressful. Carrying her everywhere pulls on my g-tube, making it very sore, but I don’t want to drop her. Today a different vet here at the hospital said it was okay to let her walk on flat surfaces so I don’t have to carry her all the time. That will help. It is an amazing God we have that puts the right people in place when we need them. Glad Dr H was able to help. Some day, when all is right in Goldie’s world again, you may be able to laugh as you tell the story of Dr H immobilizing the wrong leg. Yes, I agree. I wasn’t upset with him, but I wanted it fixed. He apologized and patched her up. All the people at the vet have been so kind and helpful. Truly God’s blessings. Thank you for reading my post. We’ve had a stressful couple of days, but feel optimistic today since Goldie ate and drank a little. She is learning to relieve herself with only three available legs! Martha, I am so sorry…You and Goldie don’t deserve this. I am hoping that everything is now on the upswing and you two will be running around soon. I shall pray for Goldie’s speedy recovery….and tell her if she comes to the zoo on a Tuesday I have TREATS!!! Martha, what kind of a stupid vet would bandage the wrong leg? He was very apologetic and corrected his mistake so I didn’t give him a hard time. 🙏Merciful Lord, touch Goldie with Your gentle hand of healing and comfort. We pray that You would supernaturally deliver her of her symptoms of injured hip and healing the underlying cause of her ailment. We also pray that You would use veterinarians, medicines, and natural means to bring her once more to good health. Grant us wisdom and compassion as we care for her as Your stewards. In Jesus’ name. Amen.